Churches that want to thrive now and in the coming decades must reach young families who have children. They bring the promise that a church will continue to exist in the future. Today's young parents are the Millennials. And if you want to reach them, then it is crucial that you have an excellent children's ministry. 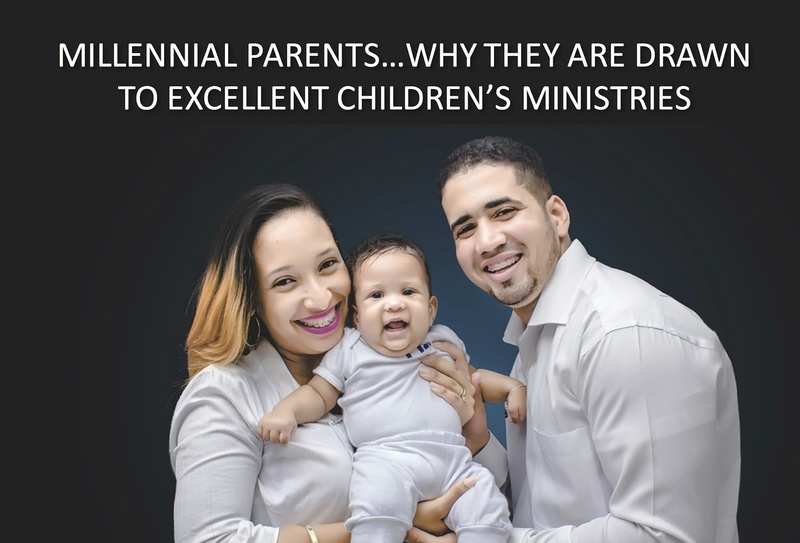 Millennial parents are highly invested in their children and are drawn to excellent children's ministries. Why? They've been programmed that way. A recent study by two leading psychologists, shows that Millennials tend to be perfectionists more than any previous generation. The study shows that since 1989, self-oriented perfectionism has increased by 10%, other-oriented perfectionism has increased by 16% and socially prescribed perfectionism has spiked by 33%. Growing up, they've been pushed to get better grades, excel in sports, get the best degree and land the most prestigious job. Their Gen X and Boomer parents spent unparalleled time on their academic careers and put high expectations on them. They've also been programmed to have an excellent "image" as they promote their "personal brand." They feel the pressure to post selfies and status updates that highlight their successes, family adventures and social standing. This bleeds over into every area of Millennials' lives...including their expectations of church. They want excellence in their worship experience...and even more excellence in their children's experience at church. They have very high expectations when evaluating what church they want to place their children in. When Millennials walk into your church, they are not just comparing the experience to another church down the street, but also to their experience at stores, coffee shops, schools and places of entertainment. Churches that want to attract Millennial parents and their children should pour a significant percentage of their time, resources and efforts into creating an excellent children's ministry. Volunteers. Excellent children's ministry more than anything is the result of excellent volunteers. Enlisting, equipping and empowering volunteers must be a top priority. Excellent ministry also comes from excellent ratios. If Millennial parents look into a preschool room and see 20 kids being corralled with 2 stressed out volunteers, they are not likely to return. You can get help with this in my book "The Formula for Building Great Volunteer Teams." It's available at this link. Safety and Security. Millennial parents want to know their children are safe and secure when they are in your ministry's care. This includes a good check-in and check-out process, approved volunteers who have been thoroughly vetted and clear policy & procedures. We can help you with this at the upcoming Safety and Security Webinar. You can get more info. at this link. Facilities. Make your children's ministries facilities the best space in your church. A great children's ministry facility will make a children's ministry seem more excellent than it is. But a sub-par facility will make a children's ministry seem much less excellent than it may really be. Cleanliness. Excellence doesn't mean that you must have world-class, Disney World quality facilities. But it does mean you keep the facilities you have clean. You may not have the budget that Disney has, but you do have the ability to keep your facilities as clean as Disney does. Every ministry can have excellent cleanliness in their bathrooms, classrooms, hallways, grounds and common areas. Class environments. Kids must have an excellent experience at church. This can be attained by creating relevant, age-appropriate, hands-on, interactive, learner-based lessons that get kids excited about coming to church. You can get the tools you need to create this in the book "If Disney Ran Your Children's Ministry." It's available at this link. Just as important as the lesson is kids being known, loved and cared for by a caring volunteer. When kids have a relational connection in their classroom, it makes them want to return. Churches that experience growth in the next two decades will have excellent children's ministries. Churches that small groups full of young couples in the next two decades will have excellent children's ministries. Churches that make a major impact in the lives of young families in their community will have excellent children's ministries. I've often said, "When you take a child by the hand, you take a parent by the heart." I believe the best way to reach Millennial parents is by ministering to their children with excellence. No matter how far a Millennial dad is from God, he has a soft place in is heart for people who invest in his children. No matter how distracted and busy a Millennial mom is, it catches her attention when someone does something nice for her child. And no matter how long it's been since a grandfather has been inside a church, he will come see his granddaughter sing in a church service. What is our church's view of children's ministry? Do we see it as a critical ministry? How can we invest in our volunteers to help them minister with excellence? Do kids enjoy coming to our ministry environments? How can we make it more engaging, exciting and relational? Are we attracting Millennial parents? If not, what are some steps we can take to increase the excellence of our children's ministry? What can we do to make our children's ministry facilities more excellent? Fresh paint? New signage? Remodel? New construction? New flooring? Do we have an excellent safety and security plan and process in place? Do parents feel their kids are safe in our care? How can we improve this? Does the cleanliness of our facilities promote excellence? When was the last time we walked the facilities and make a check-list of repairs, upkeep, etc. that needs to be done? Do we keep our facilities clean on a weekly basis? Your turn. Let your voice be heard in the comment section below? Do you believe excellence makes a difference in reaching Millennial parents? What are some ways churches can increase their excellence factor? Share your thoughts with us. THANKS FOR SHARING. THIS IS VERY HELPFUL. GOD BLESS!